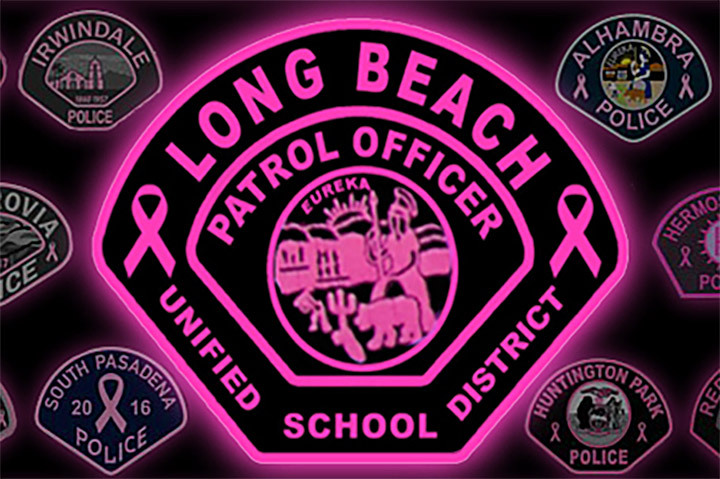 School Safety officers in the Long Beach Unified School District raised $3,300 during the month of October during their Pink Patch Project – contributing to a national campaign by law enforcement agencies that raised more than $300,000 – to help raise awareness about cancer prevention and to fund research, treatment and care of those who battle, or have battled, cancer. The collaborative effort included the Los Angeles County Police Chief’s Association and many other Los Angeles County police agencies and other first responders. Participating agencies sold commemorative pink law enforcement patches and T-shirts with all profits going to the project. LBUSD patches were sold for $10 each, with fellow employees purchasing many of them. During the same month, uniformed personnel proudly wore their pink patches as a reminder of their dedication and commitment to the effort. LBUSD’s School Safety staff recently donated the locally raised funds to the Todd Cancer Institute at Long Beach Memorial Medical Center.